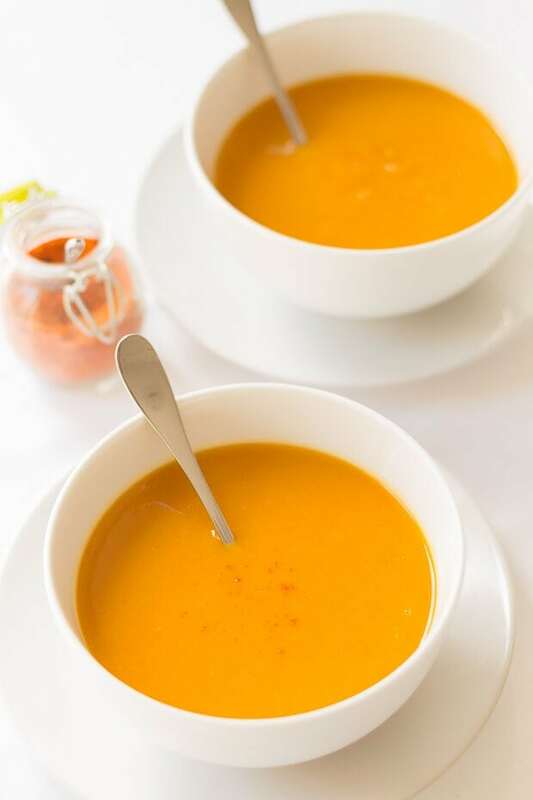 This healthy carrot and sweet potato soup recipe is delicious and simple to make. Vegan and gluten free it’s also low calorie and filling too. Dairy free, it’s a soup that gives you a warming hug just when you need it most! I know, I know, it’s another soup recipe. But it is just NOT feeling like summer here in any way at all yet. However folks I think you’ll forgive me, when you make and taste this amazing soup! It’s kind of fitting really because I recently enjoyed a sweet potato carrot soup recipe like this one. Whilst we were on holiday in Glencoe in March. From the excellent Glencoe Café. It kept me warm then. So in the spirit of keeping warm NOW. 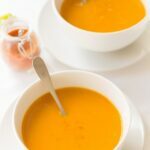 Let’s get our soup spoons out and get right into this delicious bowl of healthy carrot and sweet potato soup! I think that carrots and sweet potatoes were meant to go together. 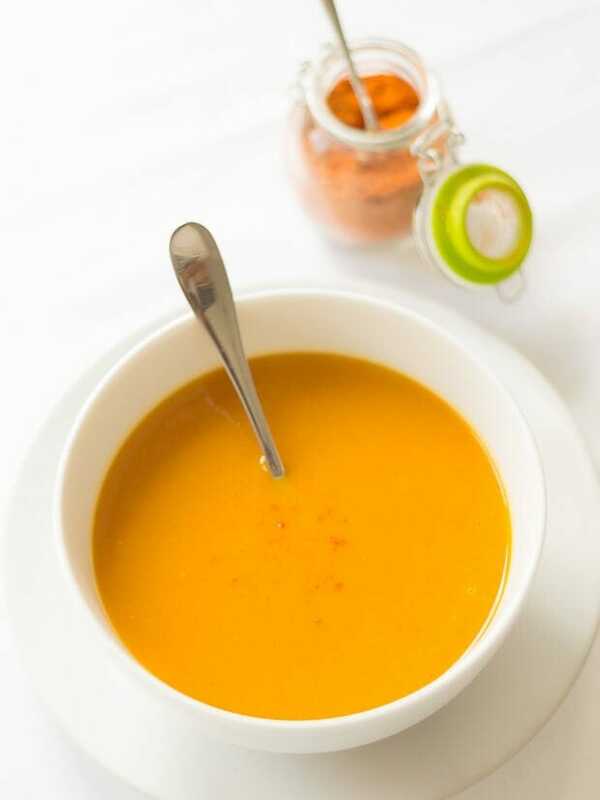 All of the carrot and sweet potato soup ingredients here just marinate so well together producing a natural sweetness. Whilst the ginger and hint of chilli add the warmth. You can feel yourself slowly warming up from head to toe as this soup slips down with every mouthful. OK, so I have to confess here further the reason for the soup recipe today…. I was planning to do a different summer type recipe but it didn’t happen. (Obviously). You see Sunday (the day planned to photograph that summer type recipe) was spent re-installing and transferring all my software to a new computer. I had to replace the creaking laptop that I’ve been working on previously. It just wasn’t designed for my daily thrashing and the software I use! Just pressing a key threw the laptop processor into a tantrum! So I’m just about finished re-installing everything, but it’s meant that particular recipe has been shelved for a while! Fortunately I had this carrot and sweet potato soup recipe already photographed! Anyway, I digress. You folks know it’s not all about soup here and I do want to get started on my summer recipes soon. But with a weekend ahead of cooking and new recipes planned, and with the weather forecast still looking dreich, I’ve had to change that plan there too from “summery” to “hearty” recipes i.e. more casseroles and one pot stews! Right, what’s coming next week? Well on Tuesday it’s a Lamb and Lentil Casserole. As I mentioned above it’s just not summer here yet so this is the perfect one pot stew to provide that warmth that the sun currently isn’t! Then on Thursday, despite what I’ve said about the weather here, if the sun does come out for photography this weekend then I will do that summery recipe which is a delicious King Prawn and Rocket Salad. So if that’s not there you’ll know what happened with the weather. Hope you can check back next week to see what actually happened! 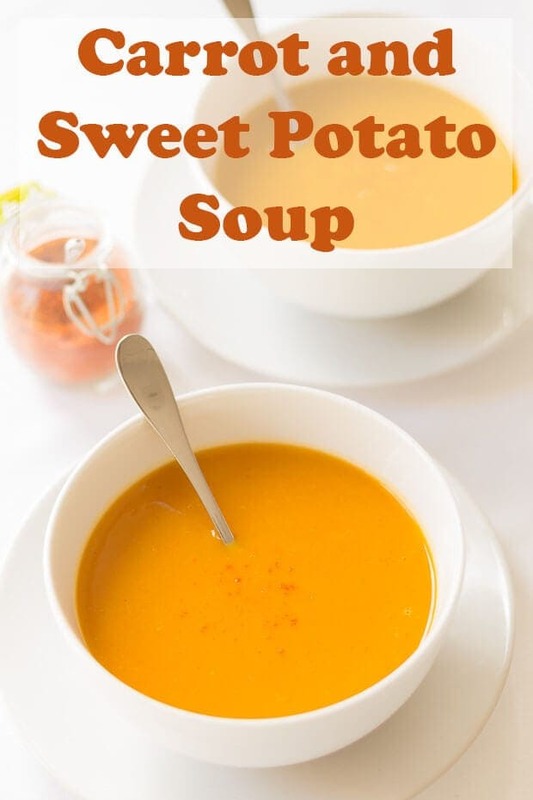 Watch the short video I made to show you how to make this simple carrot and sweet potato soup. It shows you how easy it really is! The addition of the chilli, when garnishing at the end of making this soup is optional. I like to add it as I feel it gives a little more heat and colour to the soup. 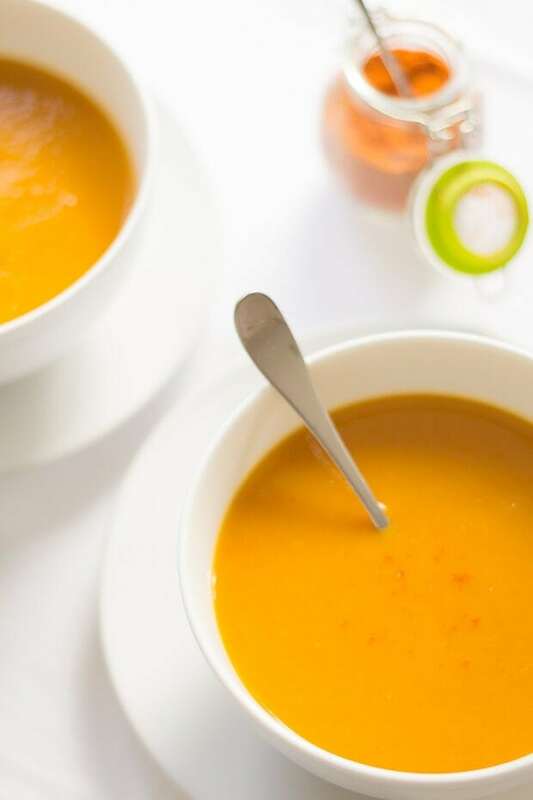 This healthy carrot and sweet potato soup recipe is delicious and simple to make. Vegan, dairy and gluten free it's also low calorie and filling too. Spray the bottom of a large soup pan about 5 times with the low fat cooking spray. Heat the soup pan on a high heat, then when the oil starts to bubble, turn the heat down to a lower heat. Sauté the onion and garlic for 2 – 3 minutes, stirring constantly to ensure they don’t burn. Add the carrots and cook for a further 2 – 3 minutes, again stirring constantly and add drops of hot water, if required, to prevent the mixture sticking to the bottom of the pan. Stir in the ground ginger and chilli powder. Stir for 30 seconds. Add the chopped sweet potato and vegetable stock. Simmer for 20 – 25 minutes until the vegetables are soft. Blitz / puree in a food processor / blender, return to the same pot and re-heat. Season to taste, serve and garnish with the mild chilli powder. I made soup the other night – butternut squash. It feels like Autumn outside still so I’m totally with you on the food choice! I have carrot and sweet potato on hand, I should totally make this. It’s so preeetty too! Congrats on getting back into your field and getting the chance to showcase your skills too. That’s excellent. Believe me, I know how frustrating the search (and being in transition) is. Good for you!!! Butternut squash soup is one on my list for future, it’ll be fun to compare your recipe to mine! Thank you re: the job. I am very thankful for the change in my circumstances and for the opportunity that has come to me. I kept faith that it would come right one day. All the motivational stuff I read must have had an impact. Thank you Susie. And I would so love to celebrate with you over soup. Plenty of it just to keep warm. Super easy to make and full of flavor. Would highly recommend. Made this last night-it was awesome! Hi. What is the serving size? Hi Michelle, thanks for contacting me. The recipe makes 4 servings. It has those details in the recipe card. I must admit its one of those soups I make quite often. It’s quite addictive! Simple and easy to make. Great flavor! Thanks for sharing.